I have a long story of combating my teenage complex of smiling and working hard on achieving a beautiful smile. That’s while I’m obsessed with my dental health and I always search for options to keep my teeth healthy. 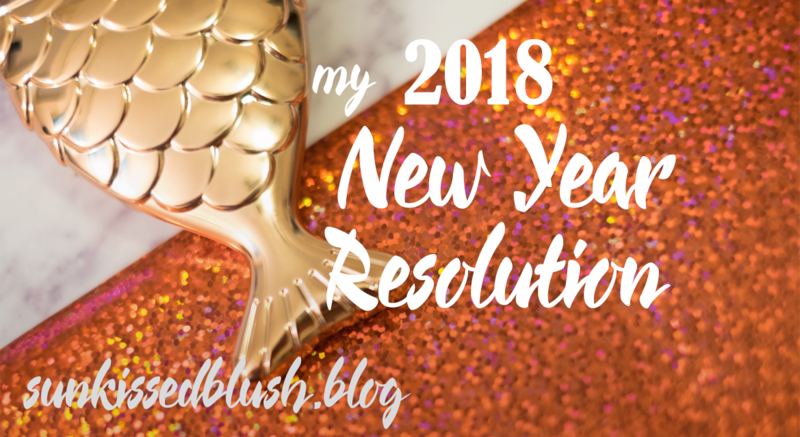 Several years ago, after visiting my dentist every 2-3 months with sudden and overwhelming caries problems, I was recommended to try Curaprox toothpastes and brushes. Honestly, since then, I didn’t have any cavities and I have been using their toothpastes twice a day for at least 3-4 years. I’ve already mentioned the toothpaste in my Empties post and received some new products from Curaprox for test. Curaprox is a Swiss brand that is using SLS-free mild formula with enzymes that helps the saliva do the magic that is already programmed in our bodies by mother nature. Fun Fact to mention here: your saliva can actually repair your teeth enamel! 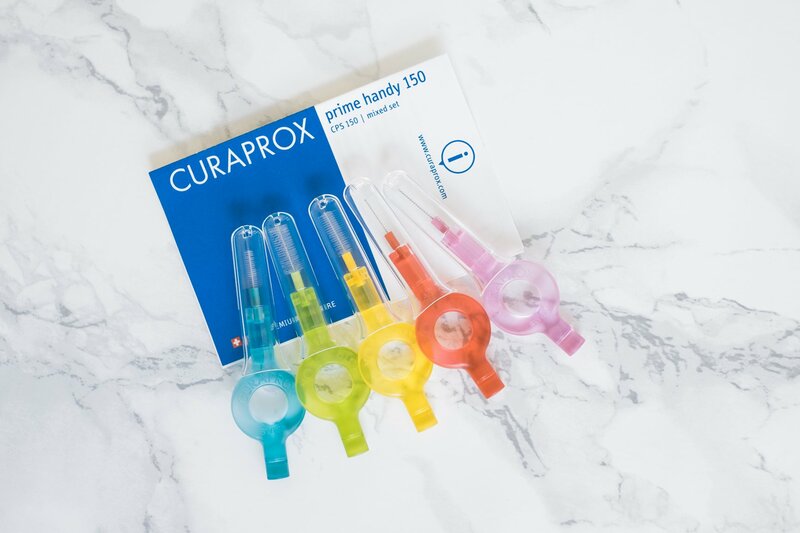 Curaprox has several different types of toothpaste with different amount of sodium fluoride that helps with tartar and cavities, including my favorite one with 1450 ppm of sodium fluoride which is hard to match at any other brand. Yes, you may say that fluoride can be bad for your overall health, however switching to fluoride-free toothpastes is not an option for me, at least for now. If you are concerned about fluoride in toothpastes, Curaprox has a toothpaste called Enzycal Zero that doesn’t contain fluoride or menthol oil but has all the good enzymes to keep your mouth and teeth healthy. With this being said, I’ve been using Curaprox Enzycal 1450 ppm for a while until I discovered their newly released Black is White Toothpaste two years ago. 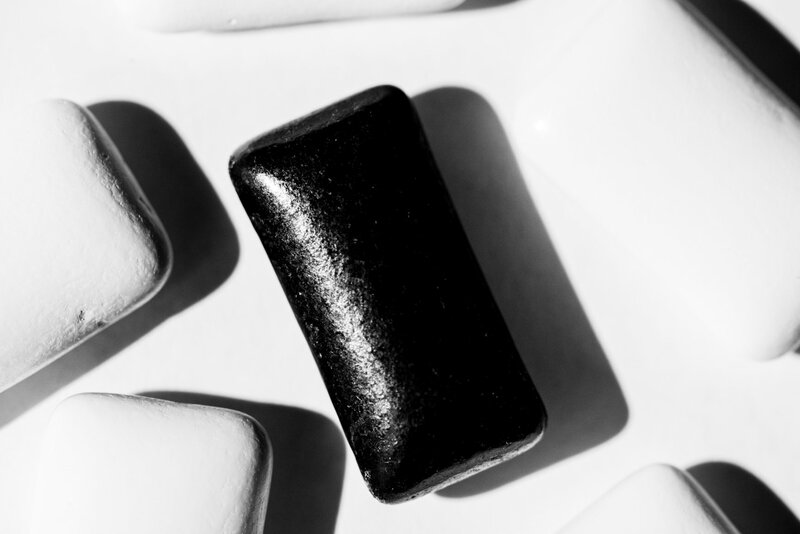 Toothpastes with charcoal have been booming all over the web, however, I was really concerned about the safety of using the charcoal over my enamel. As I said in the beginning, my obsession with my teeth makes me really caution of whatever teeth products I’m using. 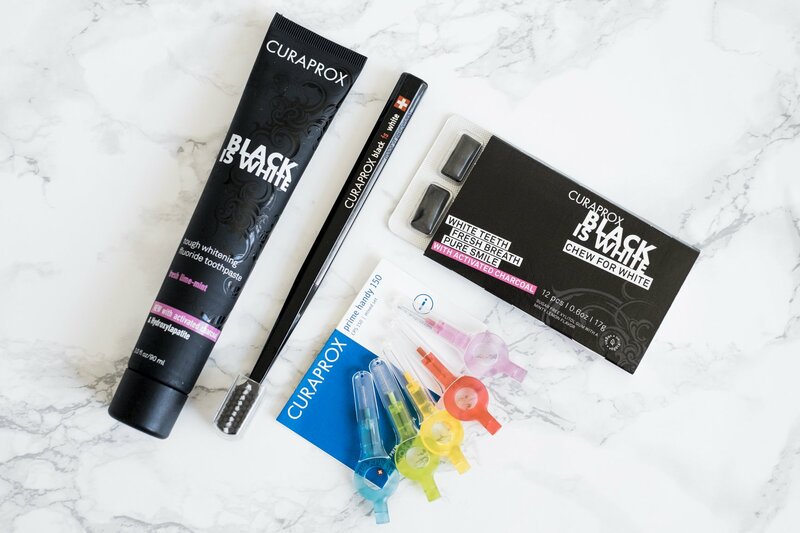 Trusting Curaprox quality and ingredients, their black toothpaste was obviously the only product I could think of trying and I’m so glad I gave it a try. The toothpaste comes with a Black CS 5460 ultra soft toothbrush. This type of toothbrush has also been recommended to me by my dentist before for being small and gentle enough for my gums and teeth. 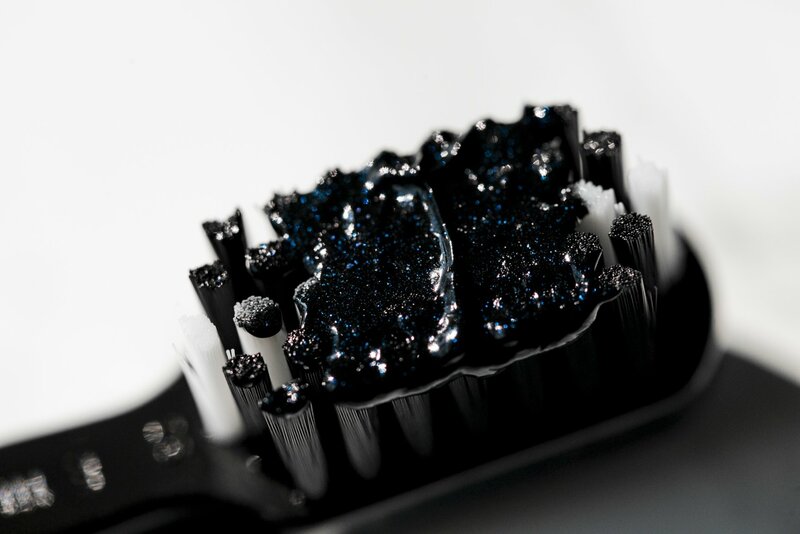 This black toothpaste really brightens the teeth and does it without abrading or bleaching. There are no tough particles that I was concerned about that could potentially scratch the enamel. 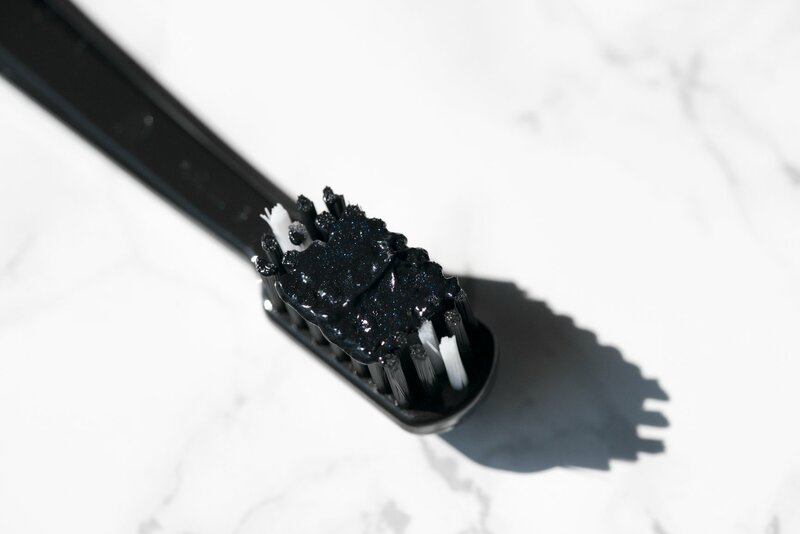 On the contrary, this black toothpaste has a smooth consistency with tiny blue sparkling filters that add cooling refreshing sensations as you brush your teeth. 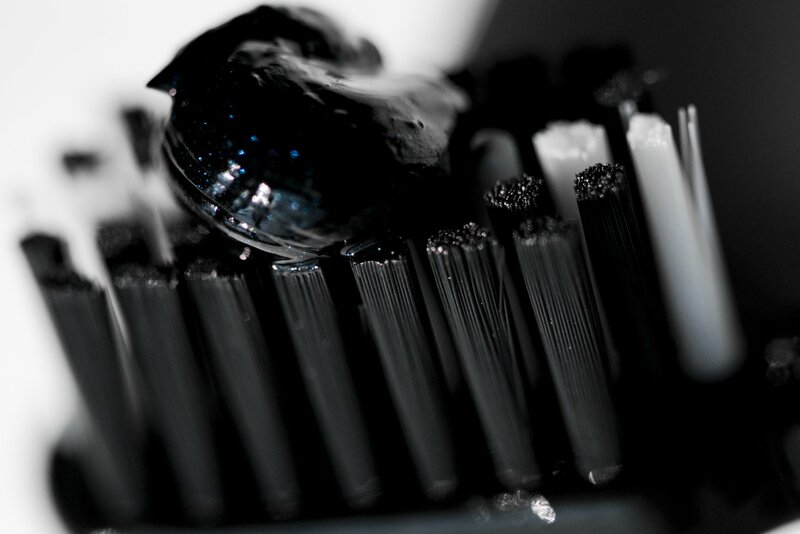 It can get a little messy though, so using it with a black toothbrush makes the whole process more esthetic. As for the ingredients, this paste is also SLS-free and contain Sodium Monofluorophosphate 0.095% (950 ppm). 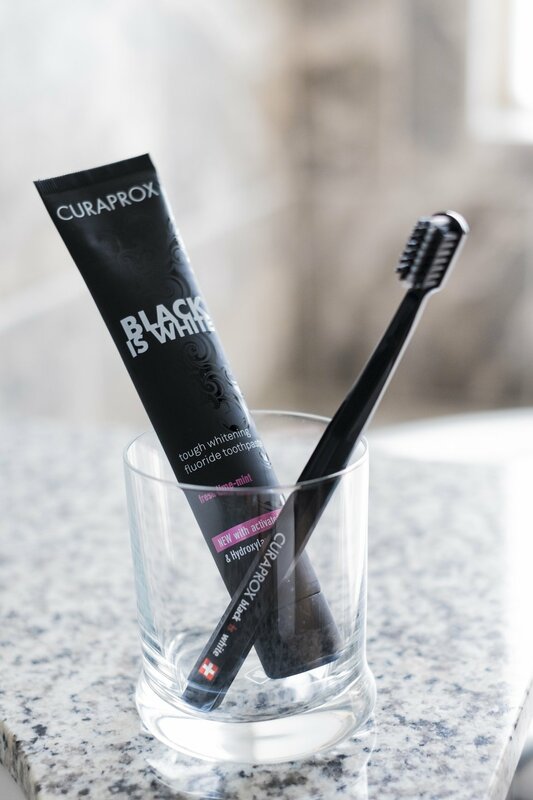 As well as other Curaprox toothpastes, Black is White also contains enzymes that protect against tooth decay while supporting your saliva in doing its work. Besides, it also contains nano hydroxylapatite (950 ppm) – a chemical compound that is already present in our bones and teeth (Boskey, 2007) and is known for it remineralizing properties for tooth enamel (Grewal et al, 2018). Moreover, hydroxyapatite also seals exposed dentine channels. 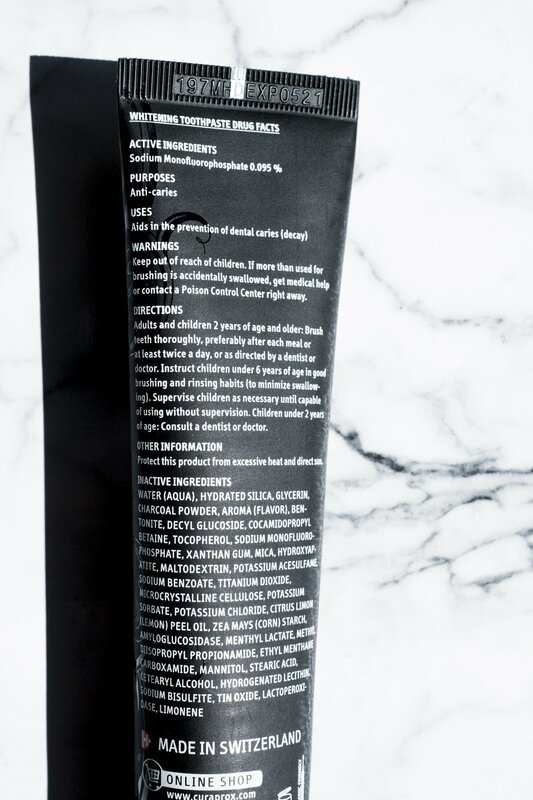 The toothpaste doesn’t contain triclosan, bleaching agents or plastic particles. Here is the before and after pictures of my teeth after first use. 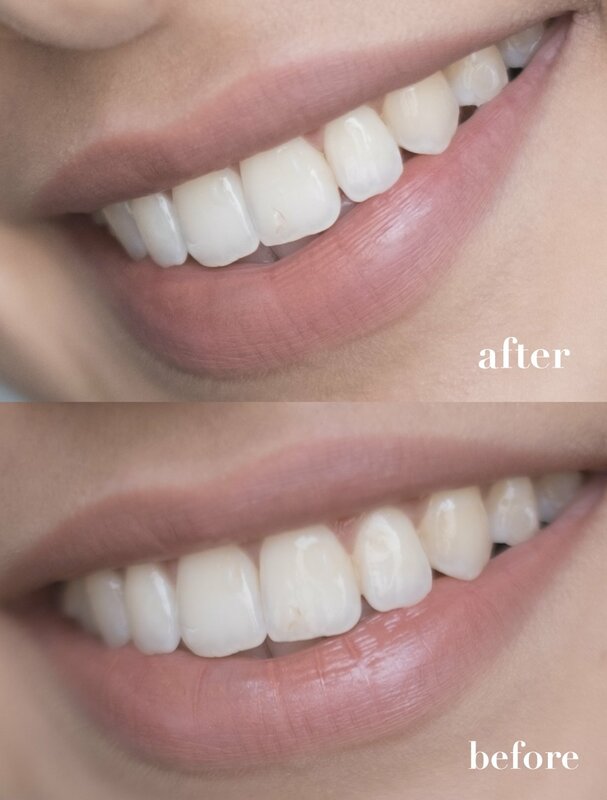 The difference may not look dramatic on pictures, but after the first use the teeth are visible brighter and more polished. From my previous experience with this toothpaste, I find the effect more noticeable with continuous use. 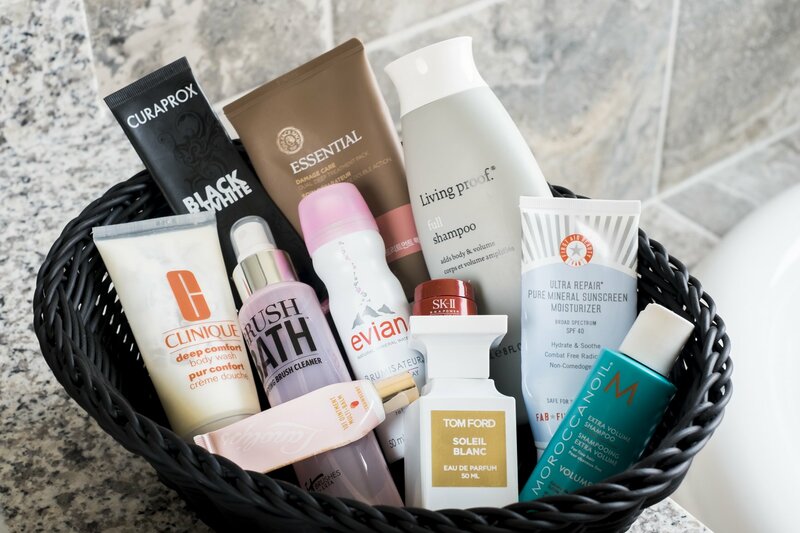 The toothpaste is sonic friendly and has a pretty good looking list of ingredients, except for Aroma (Flavor) and Limonene that is added to the toothpaste for taste and score 4-8 and 6 at EWG relatively. However, the level of toxicity depends on many factors, including the amount of chemical used, which I cannot comment on. The Black is White Toothpaste and Tooth Brush set is available at Curaprox.com for $29.99. 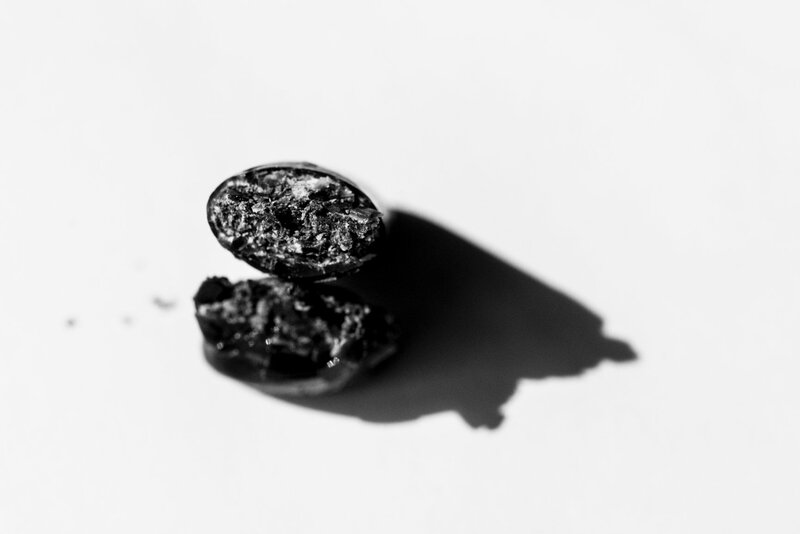 Ever heard or seen black chewing gum? Me neither. 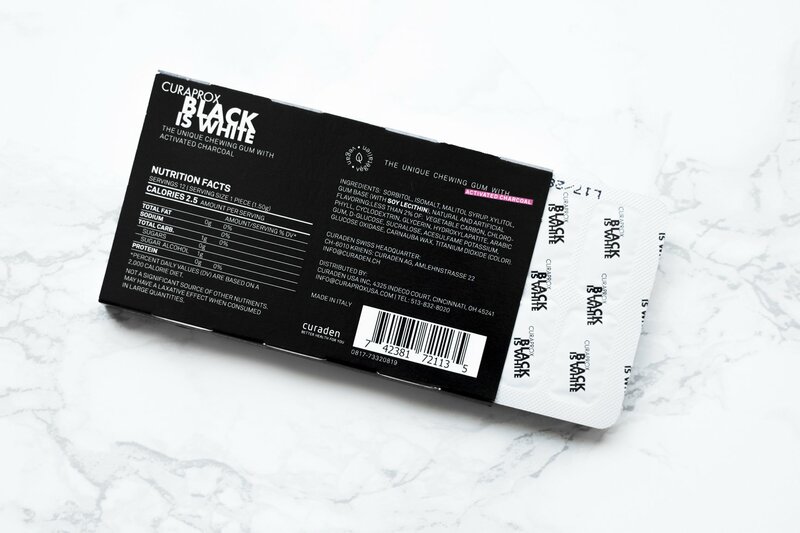 This Gum is from the same collection as the above-mentioned toothpaste and is infused with activated charcoal, hydroxylapatite and contains Xylitol which also helps to prevent tooth decay. What I like about this gum, is that it is sugar-free and is not super tough when you bite it first and it has a nice refreshing mint flavor that lingers on my palate for a while. I’m not sure if I noticed any obvious whitening effect as it gets really hard to chew a gum when you’re an Invisalign patient and have to wear trays at least for 22 hours. Nevertheless, I really liked this one for taste and also because it creates an awe when your friends see a black gum for the first time. Worth trying! The list of ingredients is really good! Besides, the chewing gum is vegan as well. 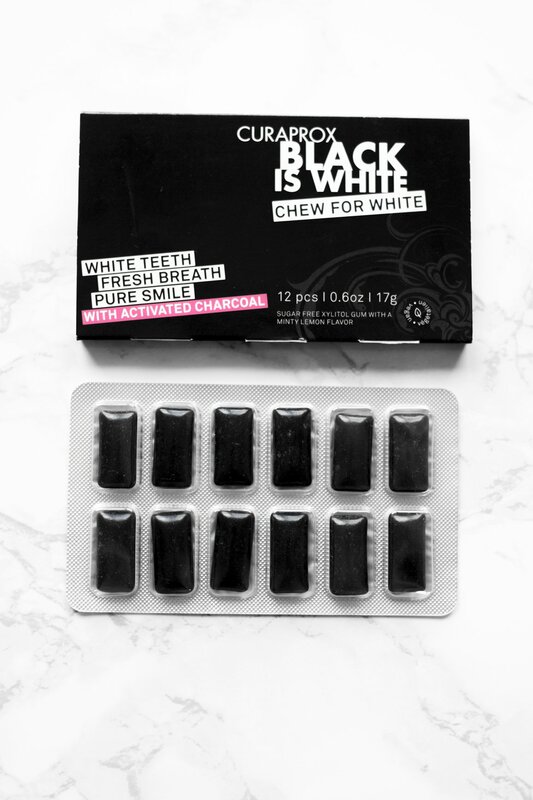 The Black is White Chewing Gum can be found at Curaprox.com for $6.95. 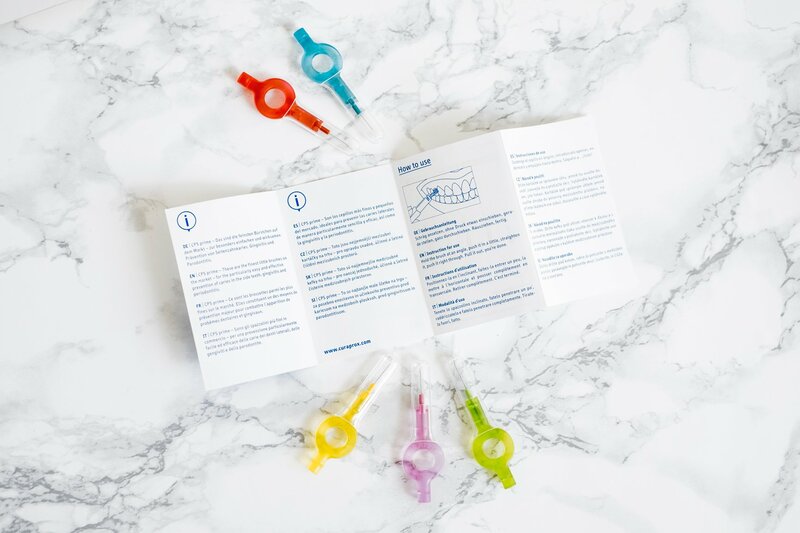 This is a set of five interdental brushes with different diameters of the brush since the gaps of your teeth will differ and you’d need different brushes to clean the space where your toothbrush can’t get through. The best way to determine the right size is probably talking to your dentist, because if you choose too small you’ll under clean, if it’s too big you can damage your gums. I was pretty sure I don’t need interdental brushes because I use a floss, however after trying one, now I know that I need to add it to my hygiene regime as well. Better late than never! My regular dental appointment hasn’t yet approached so to be safe with my super tight teeth I tried the smallest brush in blue and honestly, I really liked it! 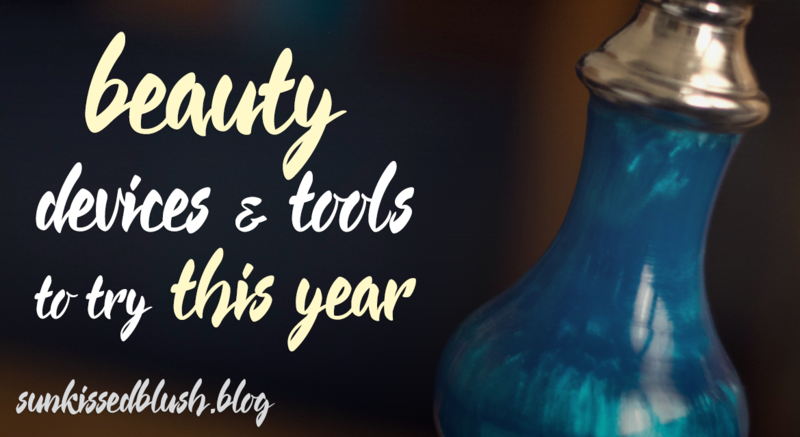 The round handle is very comfortable to hold and the brush has a cap so that I can carry it in my purse. 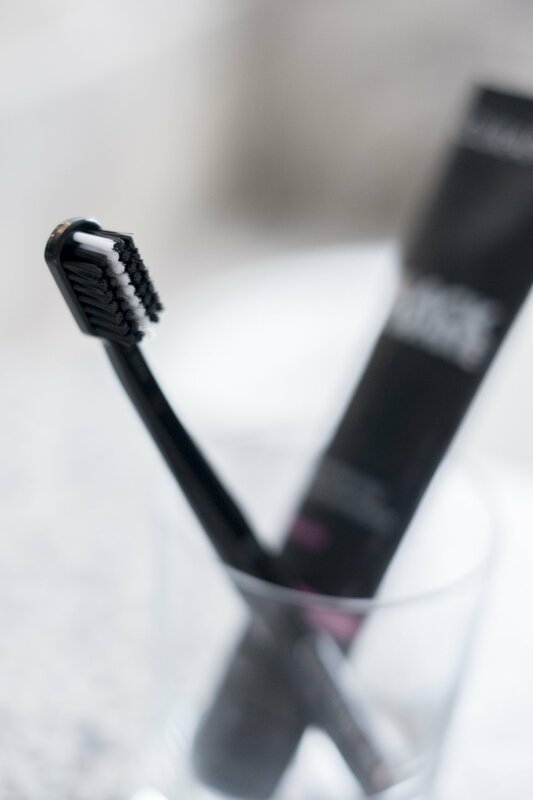 Each brush features ultrafine tapered bristles with umbrella effect and a patented surgical wire for the smallest interdental spaces. 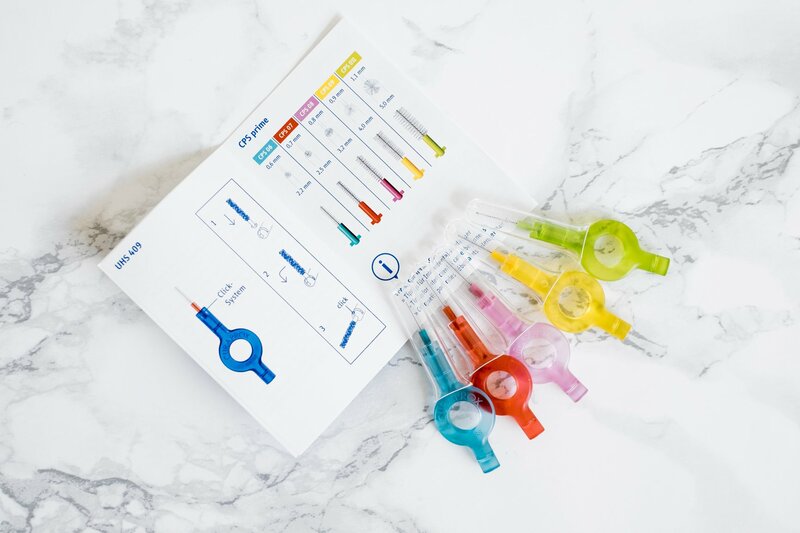 The brushes are promised to serve you long and the brush head can be easily exchanged since all of the interdental brush holders feature a click system. I haven’t used them long enough to say exactly for how long it will last. The set is available at Curaprox.com for $10.95. Overall, Curaprox is maintaining its quality and the chewing gum and the interdental brushes don’t disappoint so far. I really like the flavor, list of ingredients and the right level of softness of the chewing gum while the smallest interdental brush is very easy and comfortable to use. Curaprox is also sold in Azerbaijan! You can get more information about the distributors on their official website. I’d like to thank Curaprox for sending me these products for test. Grewal, Navneet & Sharma, Neha & Kaur, Nirapjeet. (2018). Surface remineralization potential of nano-hydroxyapatite, sodium monofluorophosphate, and amine fluoride containing dentifrices on primary and permanent enamel surfaces: An in vitro study. Journal of Indian Society of Pedodontics and Preventive Dentistry. 36. 158.